In this space wallpaper, this chart compares the first Earth-size planets found around a sun-like star to planets in our own solar system, Earth and Venus. NASA's Kepler mission discovered the new found planets, called Kepler-20e and Kepler-20f. 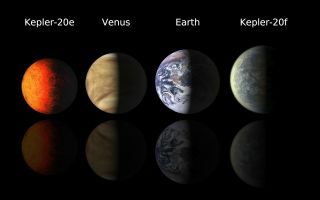 Kepler-20e is slightly smaller than Venus with a radius .87 times that of Earth. Kepler-20f is a bit larger than Earth at 1.03 times the radius of Earth. Venus is very similar in size to Earth, with a radius of .95 times that our planet. Prior to this discovery, the smallest known planet orbiting a sun-like star was Kepler-10b with a radius of 1.42 that of Earth, which translates to 2.9 times the volume. Both Kepler-20e and Kepler-20f circle in close to their star, called Kepler-20, with orbital periods of 6.1 and 19.6 days, respectively. Astronomers say the two little planets are rocky like Earth but with scorching temperatures. There are three other larger, likely gaseous planets also know to circle the same star, known as Kepler-20b, Kepler-20c and Kepler-20d.